Manuela 9 is located in the Schönblick Mountain Resort, Rauris, in the Hohe Tauern National Park. The spectacular Rauris valley "Golden Valley of the Alps" is a great location for active holidays year round, offering many options including skiing, walking, cycling, and even gold panning!! Manuela 9 is perfectly situated just a couple of minutes walk from the village amenities (shops, bars and restaurants) and the Hochalmbahn gondola from where you can access the local ski area or marked walking paths in the summer. Guests can enjoy the use of the onsite shared swimming pool and wellness area. The apartment is comfortably furnished and has a flat screen TV, DVD player and iPod docking station. There is a selection of books, games and DVDs for guests to use. The kitchen is well equipped for self catering and there is even childrens' crockery and cutlery. Large family bathroom with tiled floor and white suite comprising WC, twin wash handbasins, bath with shower attachment and separate shower cubicle. It also houses a washing machine for guests' use. Free access to own secure Wi Fi Network. Bath and hand towels provided. Sunny living room with French doors and access to the outdoor terrace. L shaped sofa with single armchair and seating cube. Flat screen TV with international channels, DVD player and iPod docking station. Extending dining table with 6 chairs. Manuela 9 is c 300 m from the Hochalmbahn gondola which gives access to the local ski area which is easy to navigate and offers a broad variety of slopes for every standard of skier. The nursery slopes and ski school meeting point are all situated conveniently at the base of the gondola. From here it is possible to take the Hochalmbahn up to 1780m and a second gondola (the Gipfelbahn) to over 2000m. You can ski down from the top on blue and red runs to the middle station with more challenging red and black routes down to the village itself. If you prefer a more gentle pace but still want to experience the mountains, there are cleared hiking paths that you can explore with snowshoes! Additionally there are 45km of groomed cross-country trails which are accessible near the resort. With the Salzburgerland Superskicard you can ski in several resorts within a 30 mins drive including Zell am See, the Gastein Valley, Saalbach and the Kitzsteinhorn Glacier in Kaprun. There are a number of golf courses within 30 minutes drive of Rauris. The closest being Goldegg and Zell am See. Outside: Terrace with outdoor furniture (table and 4 chairs). Shared grounds with BBQ. A children's park (Sommerer Park) is a short walk away Above ground parking is available. Unlimited access to resort's own wellness area including a 20m heated indoor pool, sauna and steam room. Note the Spa facilities are operated centrally with opening times determined by the local Spa management and as such not within our control. The pool may be closed at certain times of the year for maintenance. You can even watch the sun go down in the summer from the rooftop terrace. Utility Room: Secure boot/ski/bike room located in basement. A tumble drier is located in laundry room in basement of Chalet Isabella (2 Euro charge). Cleaning / Towels / Linen : Towels and bed linen provided. End of stay cleaning included. Please bring own swimming towels. Other: Selection of books, DVDs and games. High chair Child cot available on request. A brilliant ski holiday in Rauris staying in Manuela 9. The apartment had everything we needed and some lovely little extra touches (a night light in the twin room - to mention just one). It's kitted out with everything we needed to 'live' in the apartment and the kitchen is very well equipped for actual cooking. The location is perfect for both the town and importantly for us the main gondola station and was very clean when we arrived. There's nothing I'd change about our whole holiday experience here. Sue was very helpful when we had flight issues out of the UK (ironically due to the snow) and answered all my questions with speed! Thank you for letting us share your home! Thank you so much for taking the time to review your stay in Manuela 9, and that you found the apartment and location suitable and convenient for you and your family. It was great to hear that you enjoyed the holiday, especially after such a stressful enforced last minute change to your travel plans ! Thank you for your review. 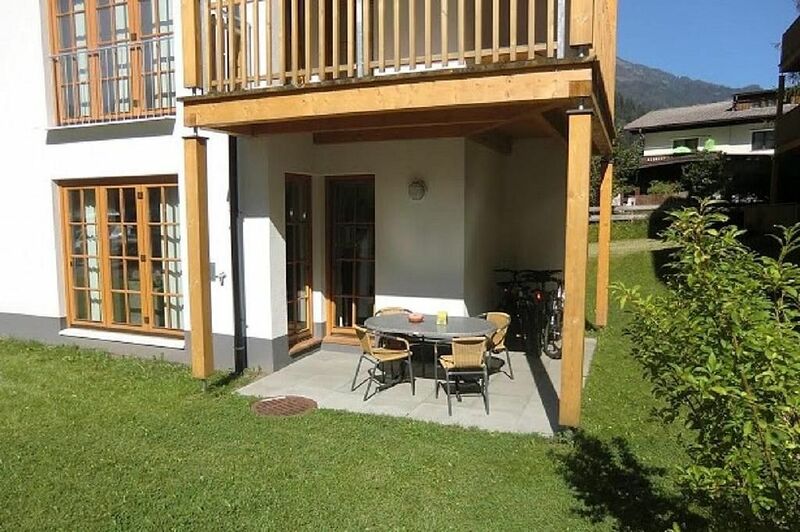 We are really pleased to hear that you enjoyed your stay in our apartment in beautiful Rauris. We look forward to welcoming you back in the future. This apartment is in a great location for the village amenities and for access to the main ski lift. It's really not far to the centre of the village where you can find nice traditional restaurants and great bars. The apartment comfortably sleeps 4, is well furnished and clean and tidy. The kitchen and bathroom appear to be quite new as they are very clean. The kitchen is perfectly well equipped for catering needs. I would have no hesitation in recommending this accommodation. Het appartement was mooi en van alle gemakken voorzien. Het was netjes en goed onderhouden. Het zwembad/wellness ging pas om 15.00 uur open, jammer voor ouderen die niet skien. Het dorpje heeft een aantal restaurants en twee prima supermarkten. Het skigebied is klein en compact. Wij waren er in de drukste week van het jaar (carnaval) dit kon het gebied t.a.v. liften en skiverhuur eigenlijk niet aan. Overal lange wachttijden. We hebben een fijne week gehad, het is een mooi gebied. We have stayed in Rauris before but will definitely be coming back to Manuela 9, this apartment has everything you could wish for. We normally eat out a lot on holiday but as we had such a great apartment with dvd's, English TV and comfy settee we ate in a lot this time. Manuela 9 is literally a couple of minutes walk from the gondola's and ski school so after a days skiing no hassle getting back. There are plenty of bars and restaurants to choose from all within a couple of minutes from the apartment. Thank you Sue and Andrew for letting us stay in your fantastic apartment - hope to book again soon for 2018!! We are so pleased that you found Manuela 9 comfortable and convenient, and that you enjoyed your holiday in Rauris. We shall look forward to welcoming you on your next ski holiday ! Manuela 9 is a fantastic apartment with everything you could ask for. It is located a stones throw from the ski slopes which made our 2nd visit the best holiday experience for us. We will be returning next year and thank the owners for letting us stay in their home. Thank you very much for your feedback. We were delighted to hear that you enjoyed your recent stay in our apartment, and we look forward to welcoming you back on a future occasion. There are 2 reputable ski schools in Rauris, Karl Maier and Adventure Rauris which off group ski or snowboard lessons for adults and children. They also offer private lessons if you prefer individual tuition. Local amenities are available in Rauris where there are a number of good, reasonably priced restaurants and bars. There are also 2 excellent supermarkets, bank with ATM, gift shops and post office. Note the shops do not open in Austria on Sundays. Ski and bike hire is available at Intersport and Eggers. There are also 2 ski schools in Rauris Karl Maier and adventure Rauris - both of which offer group and individual lessons. A toboggan run can be accessed from the top of the Kreuzboden chairlift and toboggans hired at the restaurant. This is even open a couple of evenings a week conditions permitting and it great fun for family outings. In the summer, hiking, rafting (Taxenbach), mountain biking, and paragliding are all on hand. A number of golf courses are within easy reach at Zell am See, Goldegg and Bad Gastein. There are also many diversions for the family - you can try your hand at panning for gold (when gold mining was at its height 10% of the world's gold supply was brought to the surface in this valley !) or bread baking at a hill farm. Take in the bird of prey show, or spend an afternoon at the nearby outdoor pool with its own 50m slide. There is also a summer park and mini golf course in the village. There are excellent pool/spa complexes at Badhofgastein (free access with the summer Salzburgerland card) and one just recently opened in Kaprun. There are a number of outdoor pools by the lake in Zell am See. There are many sightseeing possibilities within range of Rauris. Salzburg is a great day out and is easily reached by car in just over an hour or by train from Taxenbach. If you are more adventurous you can drive up the Grossglockner to the Franz Josef Hohe and the Pasterze glacier, or take a trip to the high dams in Kaprun. If you don't fancy driving yourself the local bus and taxi service offers excursions to some of the local places of interest and even further afield to Venice!